Today would have been my mom's 68th birthday. Although she died almost 17 years ago, I still commemorate this day every year with a little tradition that she called her "recommended daily dose of Dairy Queen." 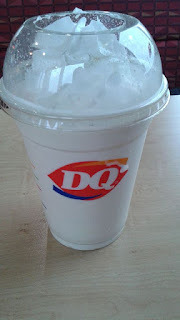 Today it was one of her favorites: a hot fudge malt! As I took my maternal communion, I thought about how much I miss her and how much she made me who I am today. As I usually do, I also pondered a lot of "what ifs?" I recently listened to an excellent podcast called Hi-Phi Nation (a story-driven philosophy podcast - sort of like This American Life with philosophers). The first episode is on the wishes of the dead: why do we spend so much time and money executing the wishes of dead people, especially when doing so interferes with the interests of the living? The podcast focuses on the wishes of the rich and powerful (like the founder of Hershey's chocolate, who wanted a weirdly specific kind of orphanage in his name). My mom was neither rich nor politically powerful. Aside from a modest check from Social Security, which I used to take a trip, there were no charitable trusts or lavish inheritances. I remember no deathbed confessions or directives. She never even asked me to go to Dairy Queen on her birthday. Nonetheless, I do feel like I owe her something. The Hi-Phi Nation podcast gets into the question of whether people can have interests after their deaths. I'm not sure if my enjoyment of Dairy Queen and Scotch (another thing she enjoyed, although less often) is serving her interests. I enjoy both things plenty on my own. So am I really just serving my own interests? I don't think so. I think the best way I serve my mom's post-mortem interests is to continue trying to be the kind of person she wanted me to be: to appreciate the value of frozen treats, reading a good book, laughter, and, above all, trying to be a good person. One of her most influential bits of wisdom was her frequent observation that it matters less what you believe and more that you're a good person... which is fortunate for me now that I'm a philosopher and believe all sorts of bizarre things! Does this mean I'm entirely sure what it means to be a good person in a way that continues to serve my mom's interests? Not at all, but I had at least one pretty good exemplar with whom I was lucky enough to share a lot of love and Dairy Queen.